Norfolk, VA, is the home of the world's largest Navy base, exciting restaurant and nightclub districts, unique shops, four tour boats and ferries, nationally recognized museums, a zoo, and a beautiful botanical garden. There's more than enough to fill your visit with fun. 155 acres of colorful landscapes, unusual flowers, mature forests and seasonal plantings. Norfolk Botanical Garden features one of the largest collections of azaleas, camellias, roses and rhododendrons on the East Coast. It provides an entertaining and educational experience for visitors of all ages. From its humble beginnings as a WPA project in 1938, Norfolk Botanical Garden has become nationally recognized and attracts visitors from around the world. Over 20 theme gardens that can be viewed by tram, boat or by foot. 12 miles of walking paths. Nauticus, the National Maritime Center, is located at 1 Waterside Drive, on the downtown waterfront adjacent to Waterside and Town Point Park. Nauticus is an exciting 120,000 square-foot science and technology center exploring the power of the sea. It includes the Hampton Roads Naval Museum, National Oceanic Atmospheric Administration exhibits, and the historic Battleship Wisconsin docked alongside. Exhibits at Nauticus include touch tanks, shark petting lagoon, weather deck, and an Aegis-class destroyer battle simulation. You can take a self-guided tour of the Wisconsin's main deck. One of America's great fine arts museums. Comprising 30,000 objects, the permanent collection spans over 5,000 years of world history. American and European paintings and sculpture from the middle ages to the present day form the core of the collection. In the Impressionist gallery alone, visitors can admire works by Monet, Degas, Renoir, Gauguin, Rodin, and Cezanne. The Museum also houses one of the world's great collections of glass, including outstanding works by Louis Comfort Tiffany. Don't miss the tours of the Norfolk Navy Base. The tour departs from the Naval Tour and Information Center located at 9079 Hampton Blvd. Bus tours conducted by Navy personnel ride past aircraft carriers, destroyers, submarines, frigates, and amphibious assault ships. The tour also drives by historic homes from the 1907 Jamestown Exposition. Sorry, but you will not be able to get on a ship (but you can go on the Battleship Wisconsin docked in downtown Norfolk ... see above). Cameras are allowed. 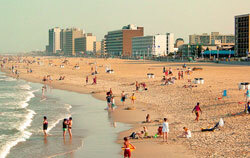 Tour schedules are subject to change so we strongly suggest that you call the tour office at 757-444-7955 before going. The Virginia Zoo displays nearly 400 animals, ranging from African elephants to Siberian tigers. Located on 53 acres adjacent to Norfolk's Lafayette Park and bordered by the Lafayette River. The spacious, beautiful grounds include wonderful gardens too. A couple blocks from the waterfront, the MacArthur Mall offers upscale shopping at 140 stores (including Nordstrom) and 17 places to eat. It's a good place to spend some time and money if the weather is bad. The mall is also handy if you lose your luggage on your trip. This historic and trendy neighborhood has many interesting boutiques, cafes, theatres and galleries. The Norfolk Tides baseball team plays at beautiful waterfront Harbor Park in downtown Norfolk. A great way to spend a summer evening. The centerpiece of the waterfront district offers food, fun and entertainment. Norfolk Waterside has some shops, but the restaurants and clubs are the big draws. 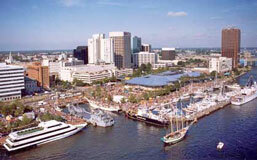 Big special events, such as the annual Norfolk Harborfest, are held next to Waterside, in Town Point Park. The Spirit of Norfolk is the largest ship cruising the Norfolk harbor and has two climate controlled decks, open strolling decks and lounge seating, dance floors, and buffet dining. Daily lunch and dinner cruises from Town Point Park. The ship is certainly a unique location for your dinner out. The tall ship sails daily April through October from the dock at the Waterside Marketplace. Spacious topside decks with seating, and climate controlled below deck cocktail lounges. Take this pedestrian ferry to visit Olde Towne Portsmouth, which is located across the river from Norfolk. It's fast, cheap and offers a panoramic harbor view. Operates every 30 minutes. With 16 convenient stops in downtown Norfolk, the NET gets you where you want to go in a comfortable air-conditioned electric bus. NET buses run every six to eighteen minutes. It's free.